Principle and Presence are the twin pillars of Science of Mind. We tend to spend a lot of time on the Universal Principle, the Law of Cause and Effect. This teaches us that we co-create our lives through our intentions and beliefs, that we are both responsible for this and free to choose to create the life we desire. Often this is a powerful antidote to traditional beliefs of living up to the rules or hoping for the grace of an outside, external God. Focusing on Universal Principle and the Law can feel empowering, but it can also feel cold and unfeeling. The Law is simply giving us what we believe, no more and no less. Yet we long to feel the impress of Life, the belonging to Love, and a sense of a larger Reality. We begin to entertain the notion that there is a God-within and that somehow, we are connected and a part of the whole Spiritual Reality. Often this comes with the difficulty of believing ourselves Divine. Yet we work to recognize this God-presence as the “I that I AM.” We sometimes call it our higher-self or our inner essence. Beyond this grows the awareness of the wholeness of Reality and that It is Alive with Life. We begin to open the larger Reality which is the Love that is the impulse back of all Life. That Love is the Divine Presence, the transcendent mystery that is at the center of each of us, as our innermost being. We touch the Divine Presence, sense and feel It, when we enter into the mystical experience of Oneness. It is in this mystical union that we realize that we are held, cradled, and completely enveloped and immersed in this ONE, more closely than a child is cradled in the arms of a parent. Science of Mind is fundamentally a mystical tradition. It invites us to release the barriers of separation that we may court the Divine and feel Its Presence as our very life. This month we hold the vision of this Divine Presence as the very truth of our being. Yes, we do belong to the Universe, and we are loved, cared for, lifted and supported in ways unimaginable. To explore the Divine Presence the first two Sundays this month we will “Stalk Joy” and “Court the Divine”. To experience the Divine Presence, we have two very special services planned. The third Sunday, Easter Morning, focuses on the sacred experience of our Oneness with the Divine and our immortality as Divine Beings. The last Sunday, through a scripted reading of excerpts of Holmes’ “Voice Celestial,” we will explore our own journey as we witness the Farer court and discover the Divine Presence. 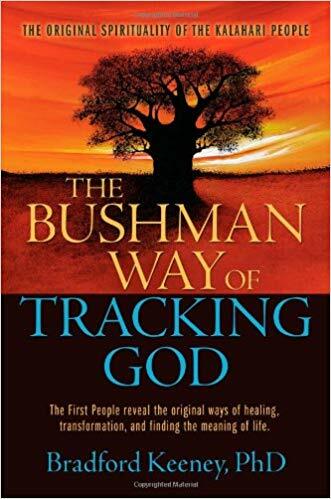 Our journey will be beautifully accompanied by The Bushman Way of Tracking God by Bradford Keeney, PhD, our April book of the month. For the first time, these ancient oral traditions have been put down onto paper by Bradford Keeney. He takes us on a journey through the veil of original spirituality, connecting the fragments of world religions to a source that is unlike any other. Through this wisdom, we can find the deepest meaning, fullest purpose, and highest joy in life.